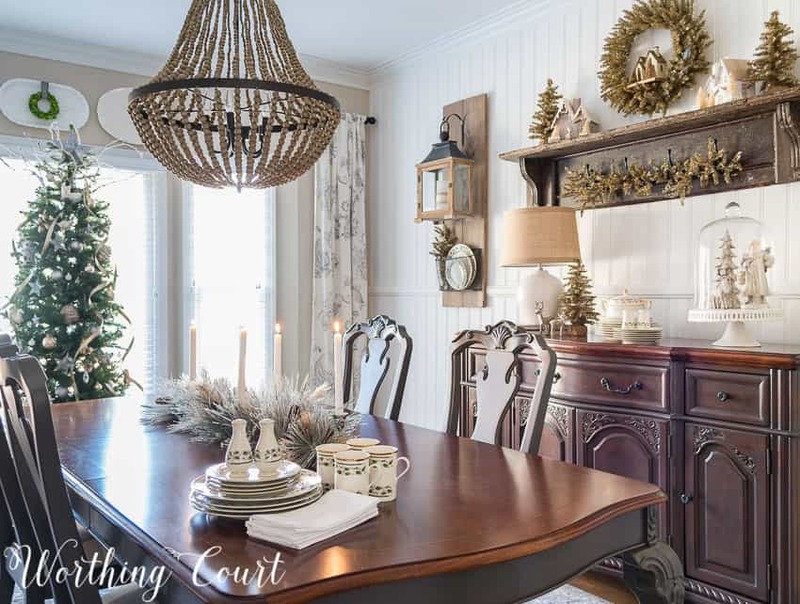 Hello everyone and welcome to my rustic glam farmhouse Christmas dining room! This is the first Christmas since I completed the dining room makeover and I’m so excited to share it with you. This was the first room in the house that I decorated for Christmas this year and it came together very easily. 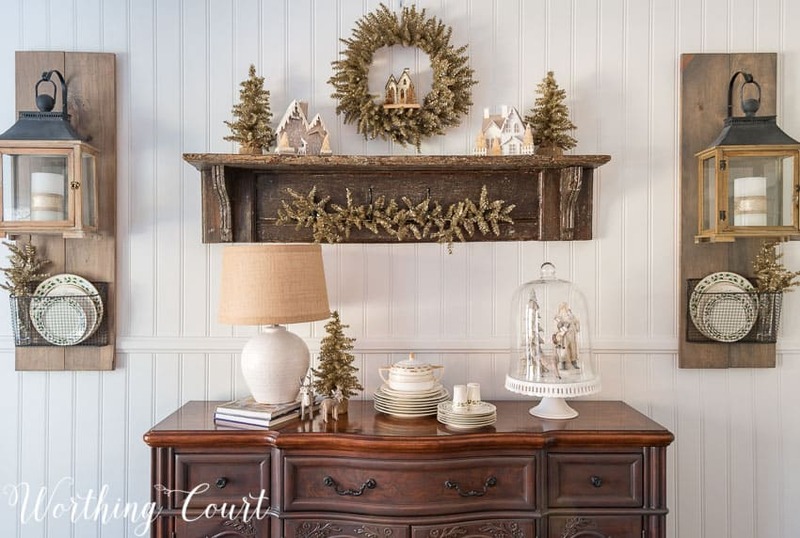 You might recognize many of the decorations that I used in here from last year’s Christmas mantel and the Christmas shelves in my breakfast area. This wreath is actually the one that I made to use over my mantel last year. I was inspired by one I had seen in a catalog. I made sure to find a spot for my NOEL Christmas pillow. It’s one of my faves! If you haven’t already, sign up for my newsletter so that you can get the link to where you can purchase one for yourself. You can sign up for the newsletter in the gray box that pops up, in the lower right hand corner of the page. 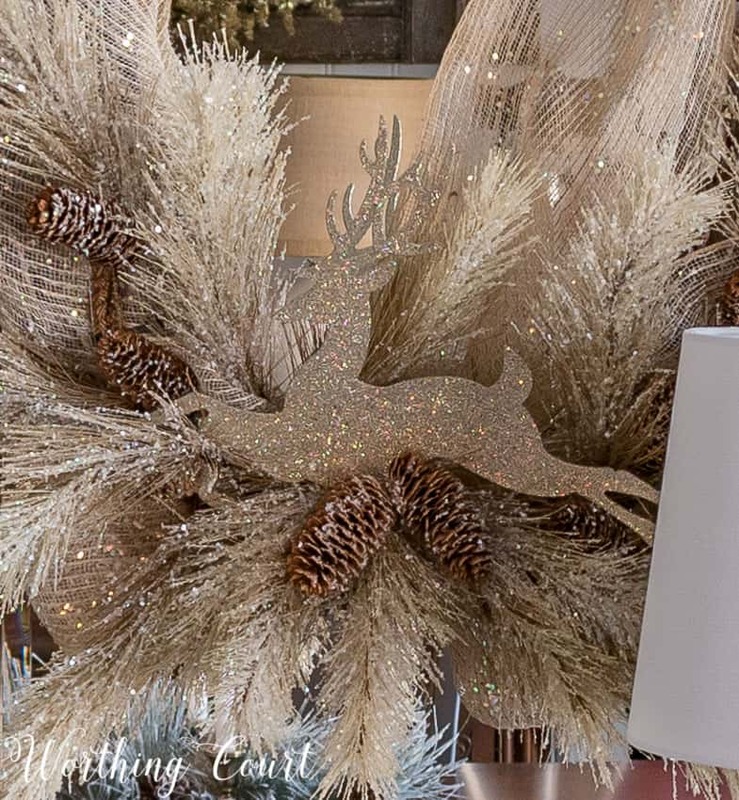 My motto this year was “no glitter allowed”, but in the dining room, that rule kind of fell by the wayside as soon as I decided to use this wreath on the mirror above the sideboard. It set the tone for the whole room. But that’s okay since I always try to dress the dining room up a bit. I’m in love with the glittered reindeer and frosted branches! 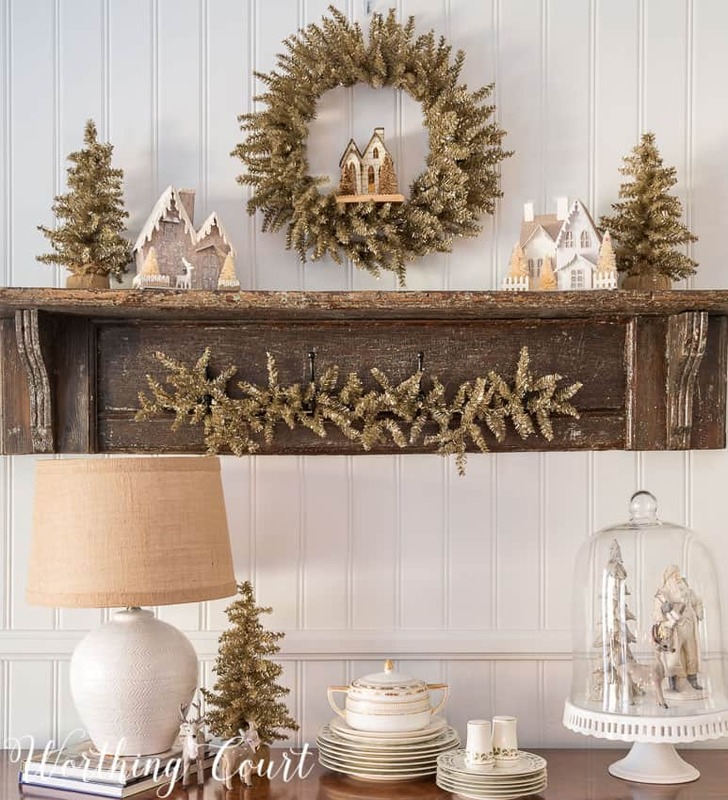 Across the room, the sideboard and vintage mantel shimmer with burnished gold trees, branches, a wreath and a few glittery houses. The candles in my diy hanging lanterns are simply dressed with a strip of ribbon around them and the baskets below contain some of my Christmas dishes. My tree is filled with all sorts of vintage ornaments, plus a few that I purchased last year. Lighted branches fill the top and trailing glitter tape falls naturally down the length of the tree. 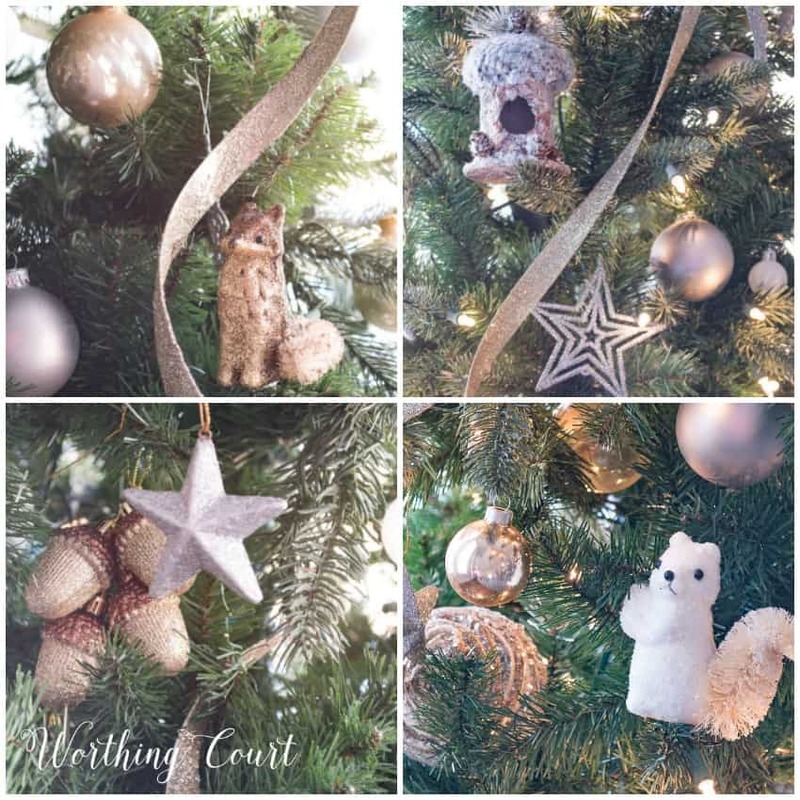 The ornaments may be shimmery and glittery, but many of them are nature inspired. The centerpiece for the table is about as easy as you can get and will be easy to set a table around for dining. I simply folded a frosted pine garland in half and wrapped some of the branches around each other to hold it together. Then I tucked in natural colored faux pine pieces (from picks that I cut apart) and added a few of my vintage silver candle holders. I didn’t bother to polish the tarnish that’s on them as I think it adds to vintage vibe. Christmas dinner is going to feel so special in my dining room this year! This is about the last of the glitter that you’ll see in my house this Christmas. The rest of the house looks totally different. I’ll be sharing more soon! When do you start your Christmas decorating? Love it! I think I’ll copy your table idea. So simple but looks great! Your rustic dining room looks great. I like the idea of putting wreaths on mirrors, so I am going to try that. Working on my dining room now! Where did you get your holiday houses? I have been looking everywhere and nothing seems to grab me, but I do like these ! Hi Loyda. I’ve picked those little houses up several places – TJ Maxx , At Home and a local home decor shop. I have trouble finding ones that I like too. Everything is so pretty. I love that wreath you made and it is just the perfect amount of glitter. I just love your dinning room. I have saved a few of you many ideas & am so excited to use them in my own home. Absolutely beautiful Suzy. I am in love with your decorating. Oh so lovely! I love those lanterns and the way you’ve hung them. I am so excited to start my decorating this year. I try to hold off until after Thanksgiving dinner. My family decorates my tree then. But way before, I have visions of decorating dancing in my head! Ha! Thanks for your inspirations. Absolutely Beautiful. I love your rustic elegant dining room. Stunning!! Thanks for the inspiration! I love your style of decorating, however, I am not a fan of very much glitter either! I do have some things that I will use anyway, but the glitter always seems to stay around until at least June!! Love, love, love your dining room table centerpiece! I will be borrowing that wonderful idea! The whole room is lovely! Can’t wait to see the rest of the house! Have a wonderful Thanksgiving! Lol on not wanting glitter and then going all out – some things just seem to take on a life of their own. I can’t imagine what your vision was for your dining room, but I think the glam and rustic vibe is lovely. I’m going to play around with one of my garlands and see if I like it folded in half on my table – I’ve never used a garland there before. I can’t wait to see how you decorated everything else in your other rooms. We’ve had our first snow of the year here in Michigan and once I knew it was on the way, I removed all outdoor fall decor. I didn’t put up any of my Christmas decor yet. Inside, I’ve scaled by on my fall palette, but I still have my white and olive sweater pumpkins, some faux leaves in glasses and tea cups, and three tiny ceramic orange pumpkins in my dining space. I’ll put those away after Thanksgiving dinner and slowly begin to bring out my Christmas decor. I’ve been pinning, but I’m not sure about my look for this year – definitely shopping the house and hopefully make some new things from supplies I already own. I just love your centerpiece. It’s so simple and elegant. Perfect. 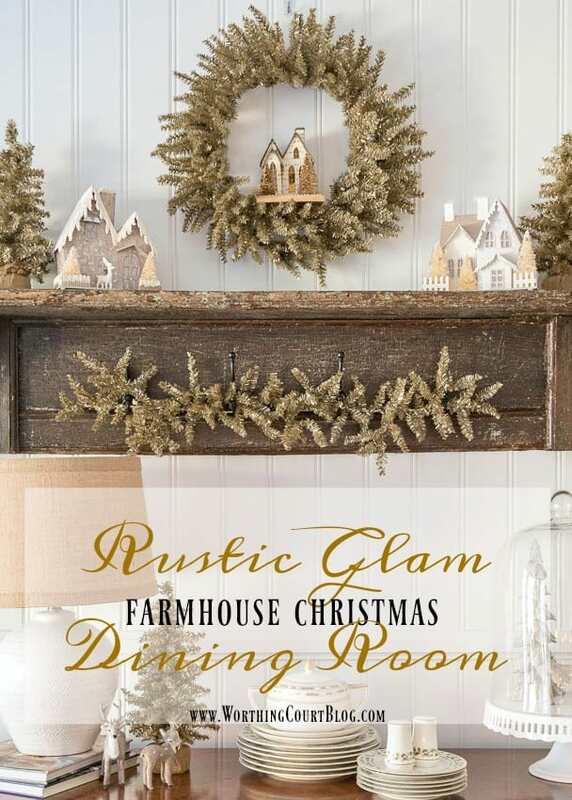 I like the mix of rustic and glitter. It gives you the best of both decorating styles with out that stuffy ” look but don’t touch” feel ..great job. Hi Jeanne. I made the wreath last year after being inspired by one I saw in a catalog. So glad you like it! What a beautiful room! By the way, I have seen little holiday houses on the QVC website under Valerie Parr Hill for the home. Looks awesome!! Glad you used your old tree in the dining room. It really adds a lot and will make Christmas dinner extra special this year!! ??? Very pretty! Love the neutral! LOVE the colors so warm and inviting! Nothing beats those classic little houses too, they remind me of when I was young, so nice to see them making a come back! Just beautiful! Love the neutral tones!.. AND the glitter! Your dining room is beautiful! How did you hang your plates on the shutters? Hi Dawn. I used regular clamp type plate hangers (the kind that have a hook shape for the bottom and top of the plate with springs running in between) and then ran floral wire through one of the slats of the shutters to attach them. Hope this makes sense! I love the decorating that you’ve done in your dining room. I haven’t started decorating my house for Christmas yet but I hope to begin soon. My 4 children are all grown and last year my son and his wife hosted our family Christmas for the fist time. That was very nice because there was more room for the family because I have a small home. But I still want to decorate my home so that I can enjoy the spirit of “Christmas”. So beautiful Suzy! You did such an amazing job, it just looks so stunning! 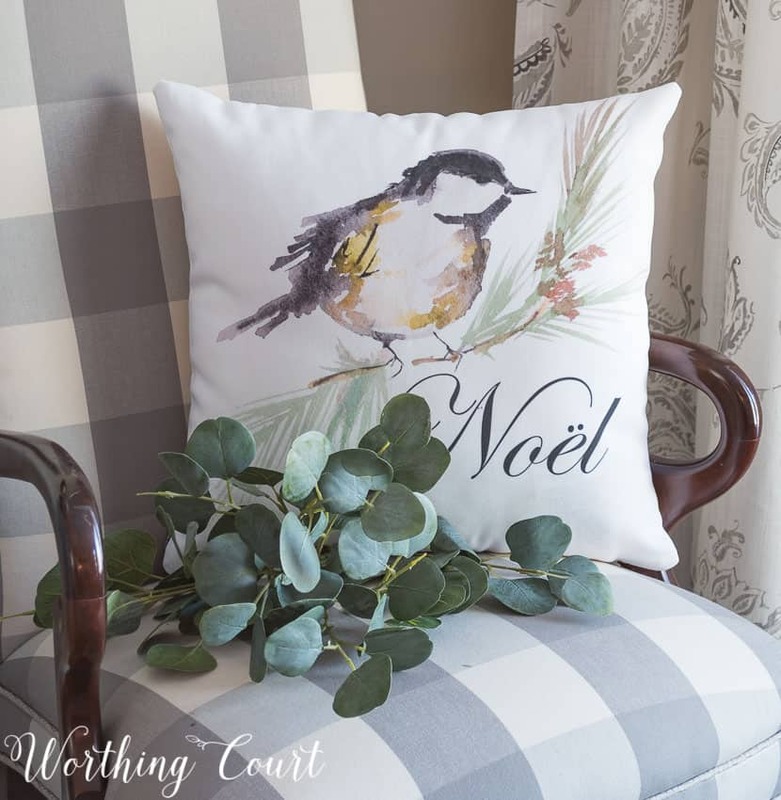 Do like the Noel/bird pillow. 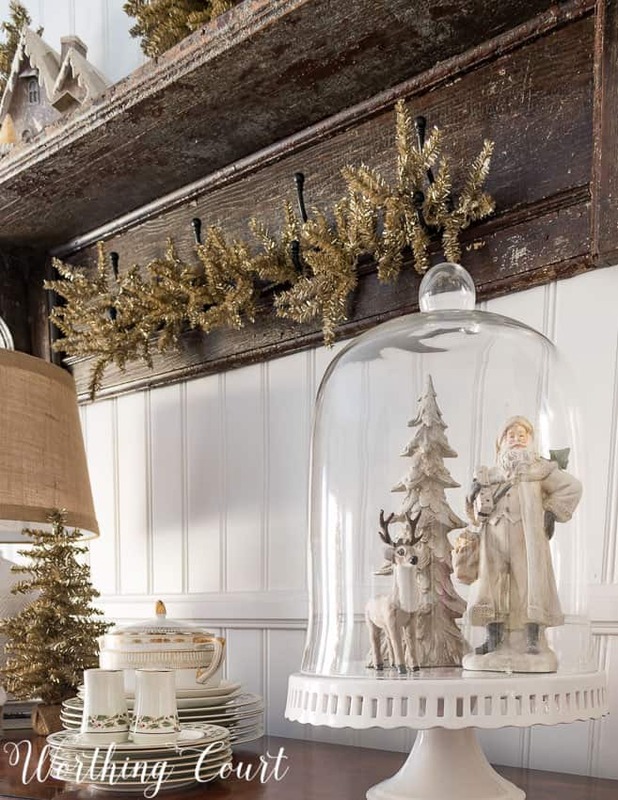 I am in love, in particular with the domed presentation of the Santy Clause and deer. Thank you for the great ideas. Suzy, gorgeous as always and I am loving the cloches with the santa. Don’t you love candlelight especially during Christmas? Thank you for giving all of us decorating-impaired beautiful ideas! Oh my! 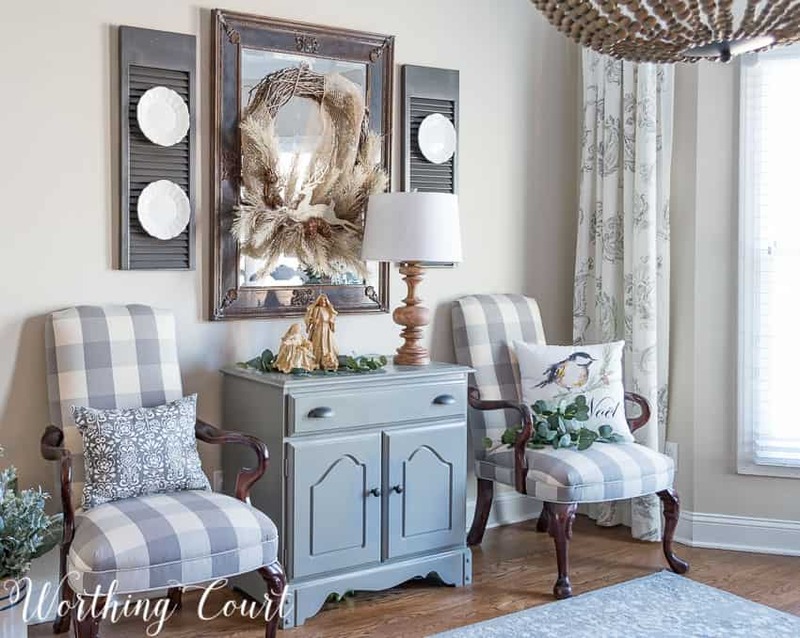 That wreath and that pillow! Just yummy!! Suzy! I simply love the burnished gold! 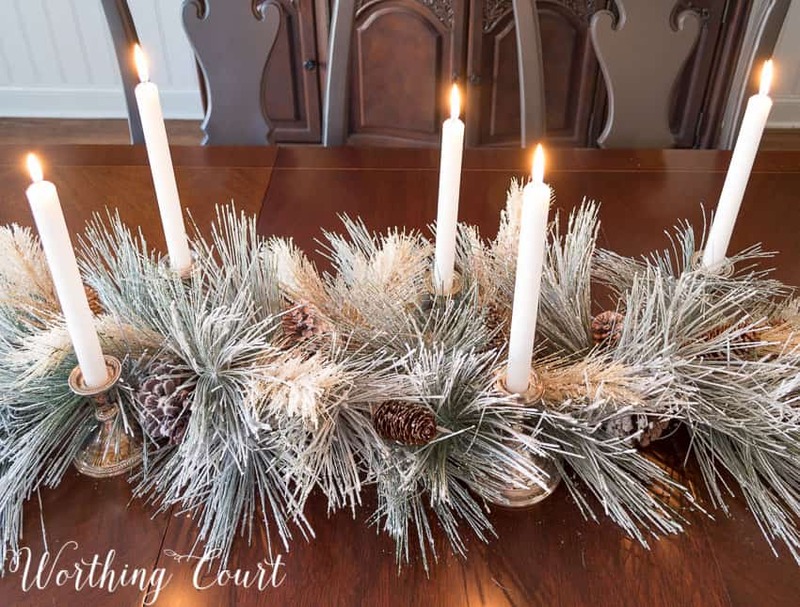 That and the wheat-colored faux branch tips on the white painted vine wreath are quite appealing to me as a fan of neutrals! Thanks for even more lovely inspiration!!! Hi Kathleen. One of the things that I love about these little houses is that they do look vintage, but they aren’t. I’ve picked them up over the last couple of years at places like TJ Maxx and HomeGoods. You so inspire me! Everything is so beautiful! Love the no glitter rule; mine this year is no plaid…even though Christmas without plaid seems “vacant”. Just want to see if I can do this! Will probably double up on them next year.! Merry CHRIST mas to ALL!? 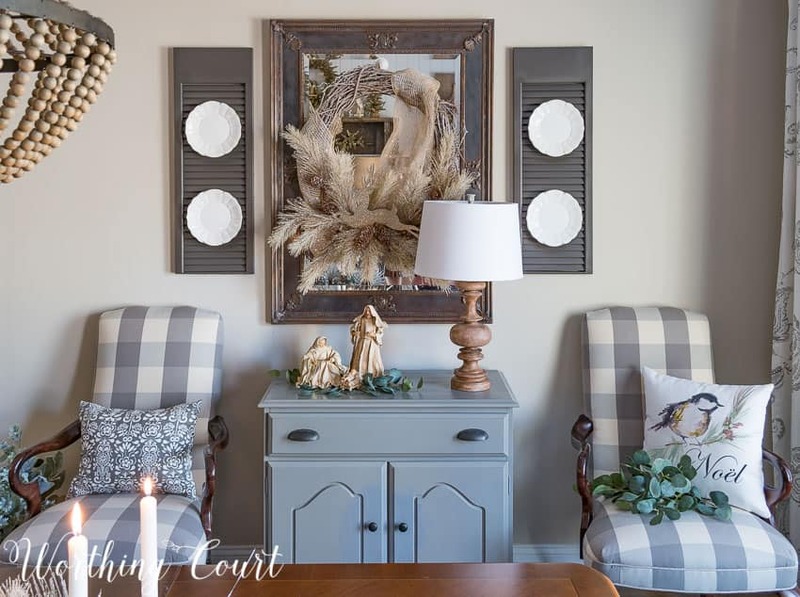 Hi Suzy, I would love to know where to buy the grey and white fabric used on the dining room chairs. Everything you share online is just beautiful! Hi Lynda. The fabric came from a local fabric store (Greensboro, NC) called Printer’s Alley. If you don’t live nearby, I think they’ll take orders over the phone and ship to you. I just love all of this! 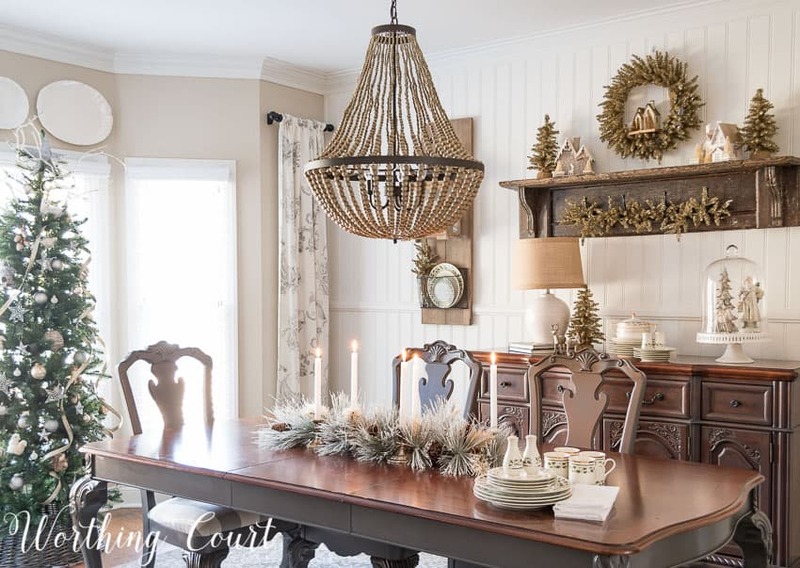 What a cozy way to share your Christmas dinner together! i love glitter, but not over the top. Your style is beautiful. I am so in love with those sweet Putz houses in your dining room! I’ve collected them over the years and just learned how to create them within the past couple of years. I’m obsessed! Merriest of Christmases to you! This is so pretty…just love the shelf … looking forward to another year of ideas. What an inviting room! Did you create the lantern board-backer (for lack of a better word coming to me) yourself? If so, do you have any tips for making the lantern holders? I love your dining room especially the wreaths and the little houses. Just beautiful. Smart decorating ideas! Beautiful home. 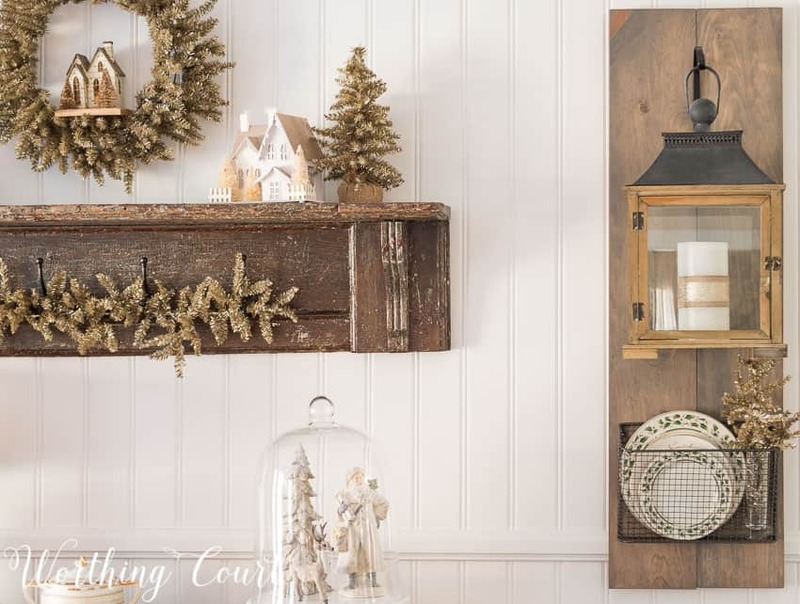 The rustic Christmas decor is perfect rustic farm style. Love your style! You’ve done a great job transforming your home with farm house style. Thanks for your ideas. Love your blog!! I love what you have done. It is so pretty and you didn’t use any red, green or plaid. I love this! Hi Patti. 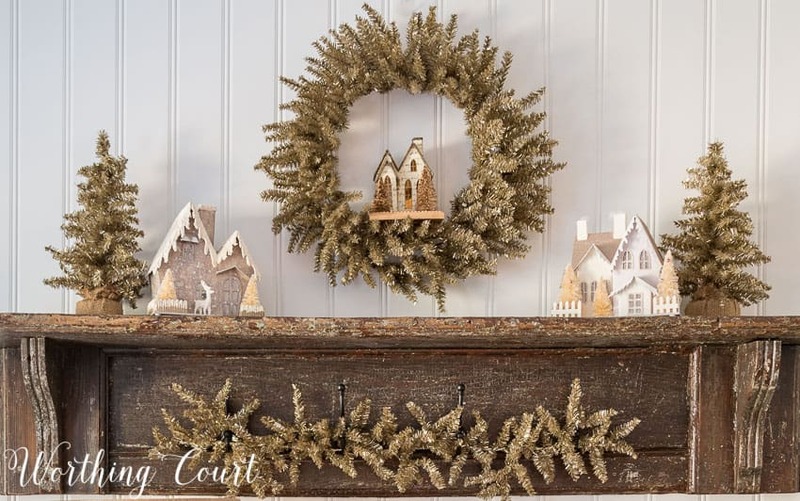 I purchased the gold wreath and small gold mini trees from Ballard Designs. Merry Christmas to you too!